Every student who comes to the Arava Institute grapples with Israeli-Arab conflict, but Anwar Dabbour is in a slightly different situation than most: she is a Druze Israeli, and identifies with both the Israeli and Arab sides. The Israeli Druze are a small ethnic and religious Arab minority, comprised of about 139,000 people. They are Arabic-speaking Israeli citizens, but not exempt from military service, like other Israeli Arabs; around eighty percent of Druze men serve in the IDF. She is very glad to be at the Arava Institute. 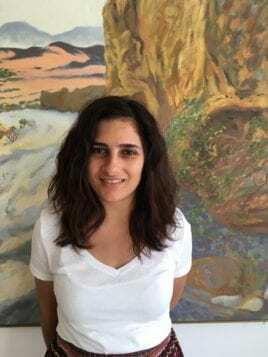 She grew up with a strong connection to nature and has always wanted to study the environment; she comes from Beit Jann in Upper Galilee—the only village inside a nature reserve in Israel, the Mt. Meron Nature Reserve. After her studies at the Arava Institute, she plans to pursue her undergraduate degree at Ben-Gurion University.